Today was the magical first day of Fall here in south Louisiana. It’s the day when you open the front door to go get the paper and are surprised and delighted by cool, crystal-clear air instead of muggy heat. Everything looks more beautiful on this day. Everything feels more hopeful. We took the kids for a walk in our pajamas early this morning. I broke out my pumpkin spice candles and threw open the windows. After Mass and lunch, Michael and I snuck away during naptime for an always-great Domestic Church circle meeting. Later, we took the kids for another walk (again, in pajamas) right before bedtime. Lovely. Today put me in a photo roundup kind of mood. We’ve had some tough moments this month on the home front–in particular with having to walk away from a contract on a house we thought was “the one.” But on a day like today, it was so easy to feel a deep gratitude for the abundance of our blessings. I hope you enjoy browsing through a few sweet (and in one instance, algae-covered) moments of the last month or so. A first! Gabriel peeled cucumbers for me. I haven’t really taught the older two children to do many things in the kitchen beyond setting and clearing the table, unloading the dishwasher, and wiping up their own spills. 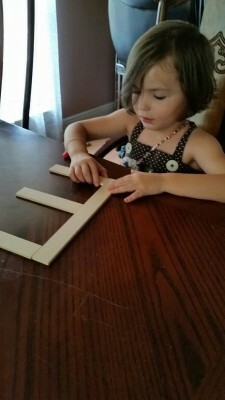 I think I’ve been in survival mode for so long with just trying to get dinner on the table at the right time that I haven’t invested a lot of time yet in teaching them to help. 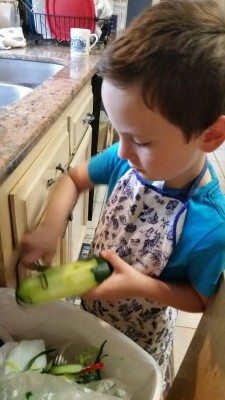 Gabe took a little longer to peel that cucumber than I would have, but he did a thorough job (as he does with everything). I have Big Plans for that one. Some friends of ours invited us to a fundraiser for Sister Dulce Maria’s ministry. I am always game for dressing up. 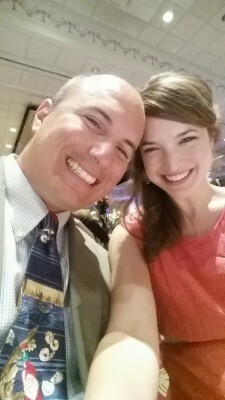 :) And this was a lovely event for a wonderful cause. Chef John Folse cooked all the food for our table. What a treat! 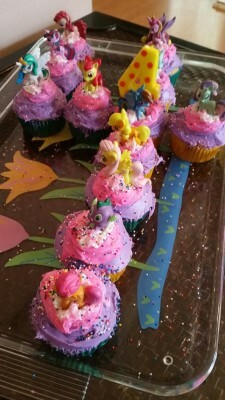 Homeschooling Faith has been going really well. She is a smart and eager student. I think she’s eating up all of the one-on-one attention. 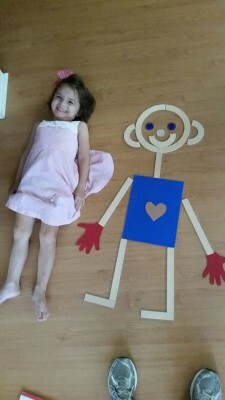 :) I am using the Get Set for School Pre-K curriculum from Handwriting without Tears, including Mat Man. I am also using some things from 26 Letters to Heaven. 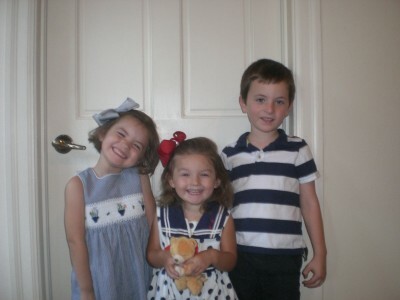 The kids stayed at Michael’s parents’ house one weekend while Michael and I helped to facilitate a Domestic Church marriage retreat. 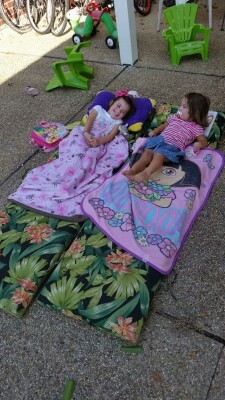 The Franklets had a great time, as usual, with their Mimi and Papa. We took the kids on the Domestic Church retreat for the first morning we were there, and we had a blast exploring the beautiful grounds at the retreat center with them. 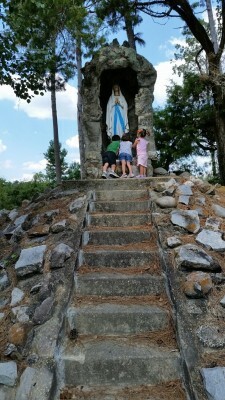 They particularly enjoyed sprinting up (and down and up) the stairs of this grotto to see Our Lady of Lourdes. 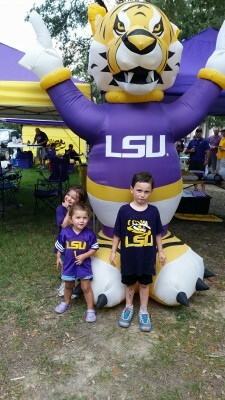 I surprised myself by feeling brave enough to take the kids tailgating by myself last weekend for the first LSU game of the season. 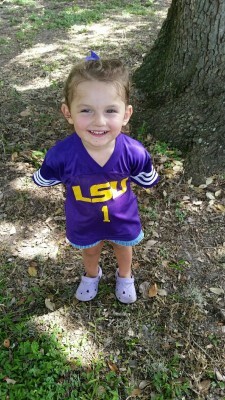 Here’s little Gianna looking so grown up. 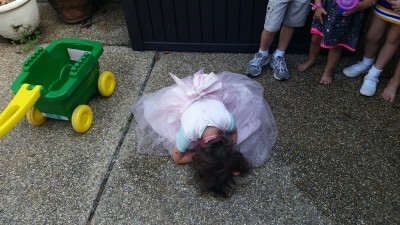 Two-year-olds are just about the best, ya’ll. Our friends’ tailgating spot is right by one of the more algae-covered, stagnant fingers of the lakes. 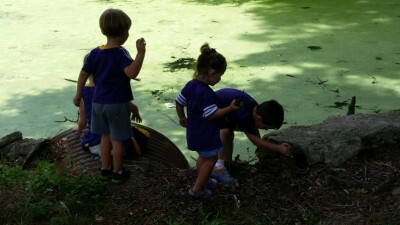 All of the kids had a blast playing by the edge of the lake all morning. I joked with my friends about how gross it would be to have one of the kids fall into the water. Wouldn’t you know that one of mine was the first to take a little dunk? Gabriel fell into the lake. And he lost his Tiger Pride for a while, poor little guy. I felt too sorry for him to fuss at him about falling into the lake, even when he was grumpy afterwards. It was difficult not to laugh. He had to do the walk of shame all the way back to the van. 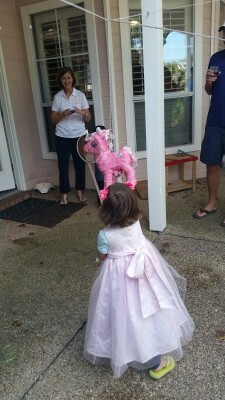 We had a very small “Rainbow Unicorn Princess” birthday party for Faith’s 4th birthday. 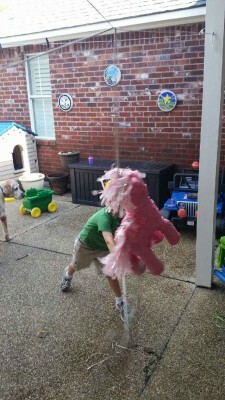 My mom got a My Little Pony pinata for the kids, which we took turns beating up with a crawfish paddle. Because that’s how we roll here in Louisiana. We decided Gabriel was the one to Bring it Home to finally get all the candy out. He delivered.